Rhino in a boma at Skukuza. Last year was a better one for South Africa’s rhino population with a decline in poaching, particularly in national parks, reported and for the first time in five years the number of rhino killed was under a thousand. 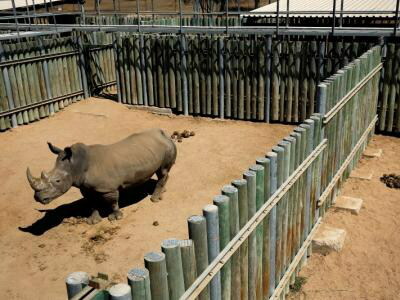 This was revealed by Environmental Affairs Minister, Nomvula Mokonyane, this week when she released a progress statement on implementation of the “integrated strategic management of rhinoceros and other associated endangered species”. “2018 recorded a decrease in rhino poaching incidents to 769, making it the third consecutive year South Africa has seen a decline in rhino poaching, particularly in national parks. This is a decrease of 259 compared to 2017 when 1 028 rhino were killed for their horns,” she said in the statement. The Kruger National Park lost 421 rhinos to poachers last year, 16% less than the 504 killed the previous year. Marakele National Park in Limpopo’s Waterberg Mountains reported its first rhino poaching loss last year. The 365 days of last year saw the same number of arrests in connection with allegations of rhino poaching and a further 36 alleged rhino horn traffickers were also arrested by representatives of various South African law enforcement agencies. As always, Kruger is the major attraction for poachers and 229 suspects were arrested in the iconic game reserve. This is 40 more than the previous year. As far as getting suspects to court, Mokonyane said there are currently 318 rhino poaching cases on the national court roll involving 645 accused and 897 charges. Two hundred and seventy-five of the cases are trial-ready. Last year the National Prosecuting Authority (NPA) obtained convictions in 78 of the 82 cases that went to trial. This is a 95.1% conviction rate with sentences of more than 500 years imposed. The Environmental Affairs Minister noted “regrettably” that elephant poaching was on the increase. Seventy-one elephants were poached in Kruger in 2018. Specific risk areas have been identified and strategies to address the threat are being adapted and implemented. One elephant was killed in KwaZulu-Natal bringing the total number of elephant lost in South Africa to 72 for the year.